Discover its features below, read testimonials from people who have built it, and place your order for plans or a completed boat. The Cambridge Racer is a performance rowing shell designed specifically for speed. 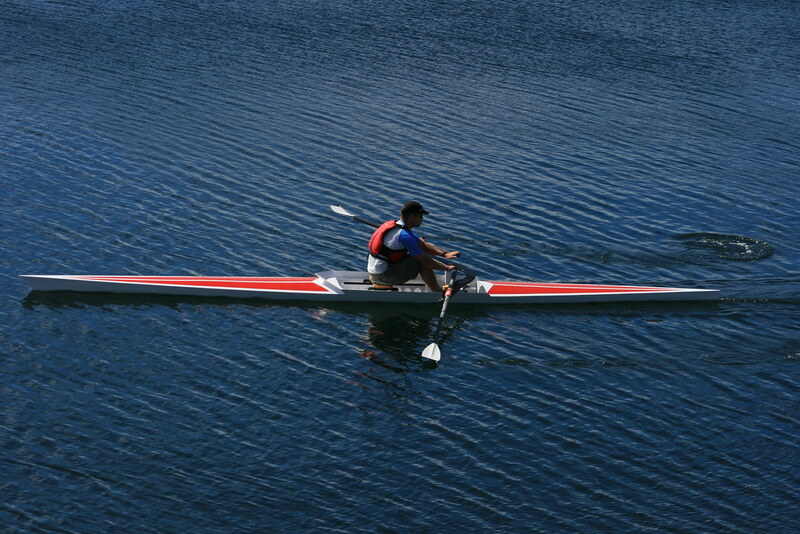 It is fastest in calm conditions, however, is shaped to perform well in open water conditions for advanced rowers. Attributes that allow this rowing shell to move easily through the water include a long waterline length, narrow beam, minimal wetted area (through strategic shaping and a rounder hull with six panels), light weight and low windage. Sliding seat rowing is the fastest type of blade propulsion, and combined with an efficient boat allows one to reach incredible speeds. An intermediate rower can maintain a speed in our shell of over 12 km/hr (6.5 knots or 7.5 mph) for one hour, or sprint in excess of 15 km/hr (8.1 knots or 9.3 mph). As well as offering good performance, the boat is stable (for a rowing shell), and can manage a two foot chop (with experienced rowers). The boat can be re-entered after capsizing and only a few gallons of water need to be bailed from the cockpit. With the addition of a self-bailer, the Cambridge Racer is a good open water rowboat in moderate conditions. For rough and stormy ocean conditions, we would recommend the Expedition Rowboat. Click the image below to view the Cambridge Racer photo gallery. This boat is ideal for those who would like to get into the sport of performance sculling at minimal cost. Often, the cost of a rowing scull, rowing hardware, and oars is in excess of $5000. The Cambridge Racer allows you to get into performance rowing at a fraction of that cost. The Cambridge Racer rowing shell is a relatively easy boat to construct. 60-70 hours are required to build this boat. Please Note: A third-party drop-in slding seat unit such as the Piantadosi can be used, however, we recommend using our integrated system which is half the cost and weight. Building plans for the rowing system are provided with the purchase of the hardware. Note: Although this boat is designed for beginners as well as experienced rowers, it does take a few days to learn to row proficiently and safely. Rowing sculls are the Porsches of human-powered vessels, so plan to spend a few hours playing and capsizing in warmer waters getting familiar with the sport and comfortable with re-entry. There are many good books and videos which offer instructions on sculling (sliding seat rowing in a shell). Never travel great distances from shore without proper support or contingency plans. Performance Characteristics @ 200 lbs disp. To purchase the Cambridge Racer plans please click on the red link below. Includes full sized plans and manual. DXF files available for an extra $30. Find out what other people have to say about their experience building the Cambridge Racer. We have completed the Cambridge Racer in January so I have been rowing with it for the past 9 months. Honestly this is the best thing I have ever had in my life and anytime I am going to row with it, it is pure fun. I have the chance to live by the sea so I go out anytime I can. I had never rowed before so the learning curve was quite steep. Anyway I would like to thank you for putting this plan online as this has allowed me to discover this fantastic activity. I can't compare it with other rowing shell but I find it very stable and I am able to row even when the weather is quite bad. Procured the wood on March 24 and completed the boat on April 18 (except for the sanding ). The instruction manual is excellent, by the way. I have been rowing on the reservoir where the Ohio State University women's crew rows and also the Columbus Rowing club. I have encountered several folks rowing the sleek carbon fiber boats. They all comment what a beautiful wooden boat I have. There is something about a wooden boat that the synthetic boats don't have. It has been 40 years since I rowed in college but it came back immediately. ( except for the physical conditioning) I did not mention with my previous email that I built my boat as a sectional. The aft 7 feet detaches for storage in the garage. It was not a difficult modification. All summer long it has not leaked a drop at the splice. Awesome, I have used your kit to build 4 boats to be used as trainers for our rowing club, saving us thousands. The plans and patterns were spot on. Thanks for a great design.